The McClelland Sculpture Park and Gallery’s annual fundraising event is on this Saturday 28 February at Dame Elizabeth Murdoch’s Cruden Farm. 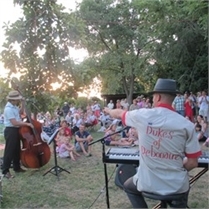 Twilight Jazz runs from 4pm- 8pm and is an evening of jazz music, picnics, wine and gourmet sausages, gift stalls, and the beautiful garden and lakes. This year, performers include the Mrs Sippy Jazz Band featuring Pippa Wilson, Dukes of Debonaire, the Beckitt Brothers, and the Frankston High School Senior Stage Band. Bring your own picnic basket and rug or table and chairs. Wine, soft drink, tea and coffee, as well as sausages, available for purchase. Tickets are $20 if purchased before 3pm today, otherwise $25 at the gate. Children under 12 are free. McClelland Sculpture Park and Gallery is a registered not-for-profit organisation promoting & supporting Australian art and providing educational and community programs for more than 40 years.